Meal prep is a relatively new concept to us. 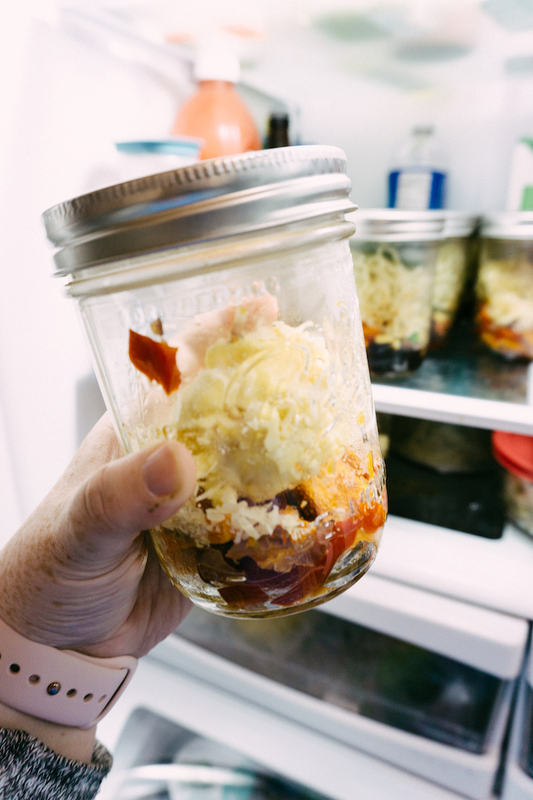 We haven't been consistently preparing breakfasts and lunches in advance, but I thought I'd share three easy Mason jar meals that you can make ahead of time to eat for breakfast or lunch throughout the week. When we do make the time to meal prep, it usually takes an hour or two on a Sunday afternoon to get everything cut and assembled. 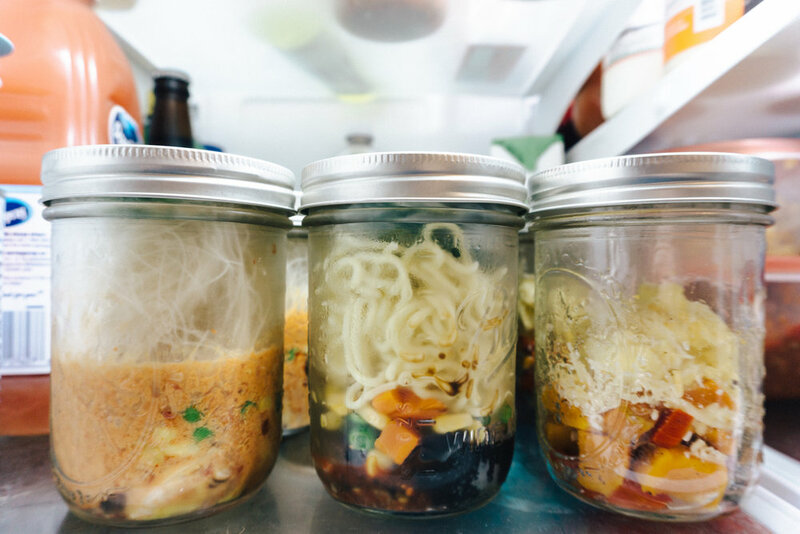 While it takes a little bit of forethought, it saves us time and money week over week and we usually consume a lot fewer calories because we aren't tempted by the convenience of grabbing a fast food meal to go. 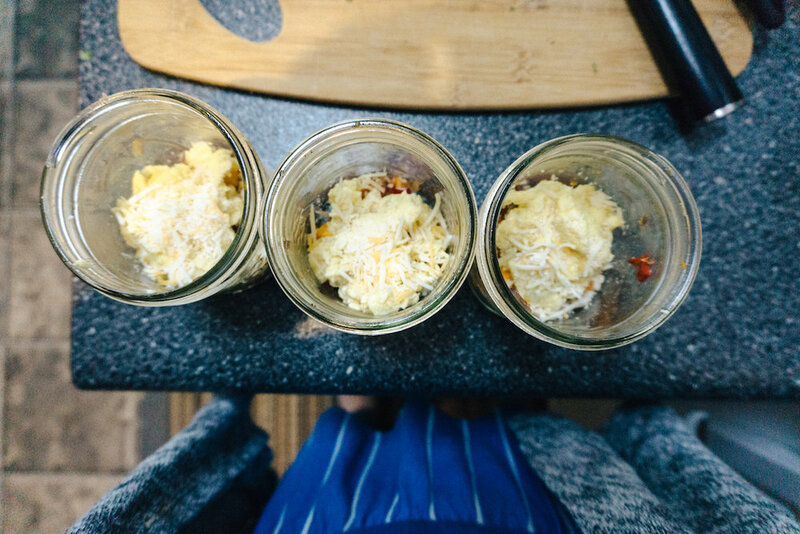 This is a great mason jar breakfast recipe that keeps me satisfied until lunchtime. After you've cut the sweet potatoes, peppers, and onions into cubes, season everything with a little salt and pepper, coat with olive oil, and roast them in the oven on a shallow, foil-lined baking sheet for about 30 minutes at 450 degrees. I scramble up eggs in the skillet and top everything off with a pinch of cheese. You could add bacon or sausage crumbles if you like! Add the beef bouillon base and chili sauce to a bottom of a mason jar and layer with the rest of the ingredients (removing the scallions for a ziplock bag for later). Be sure to chop the beef jerky, scallions, and mushrooms fairly thin. When you're ready to eat, just add boiling water to the rim of the jar and cover for a few minutes. Top with the scallions and enjoy! This mason jar recipe is a bit more complicated than the others but it's still pretty easy to throw together. We keep most of these items in our pantry so it pulls together nicely with a lot of flavor! Mix together some chicken bouillon base, brown sugar, chili sauce, coconut milk, fish sauce, and red curry paste and add it to the bottom of your jar. Top with the frozen, cooked shrimp, mushrooms, and frozen veggies. Add a nest of dry rice noodles to the top. Grab another plastic snack bag to separate your lime, cilantro, and scallions from the mix before closing up the lid. When you're ready to eat, just add boiling water! The two Mason jar noodle recipes are adapted from these Serious Eats recipes. They have a ton of other ideas on their site. Do you meal prep? Share your go-to recipes in the comments!